Missing one or more teeth is common for many people. The ADA reports that on average adult patients may have three missing or decayed teeth. Fortunately, there are a number of solutions to replace missing teeth, including dental bridges. A bridge may be used to restore an area with one or more adjacent missing teeth. A bridge has two primary components. The abutments (or supports) for the bridge are created by placing a crown on either a natural tooth or an implant. The synthetic tooth that replaces the missing tooth is called a pontic. 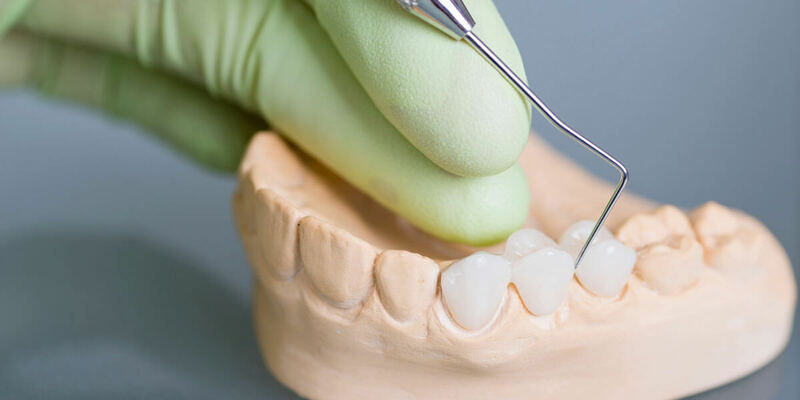 In the case of one missing tooth, the two teeth on either side will be prepped for crowns and the missing tooth will be replaced with a synthetic tooth that is connected to the crowns on either side of the missing tooth. In the case of several adjacent missing teeth, one or more implants may provide the abutment. This is the most common type of dental bridge. The existing teeth are crowned with one or more pontics between and held in place by the crowned abutments. The crowns are cemented onto the teeth adjacent to the missing teeth to create a support structure or “bridge” for the missing teeth. This type of bridge is similar to a traditional bridge, except that the structure is supported on only one side instead of both sides. This can cause the restoration to act as a “lever” and may create additional stress on the supporting tooth, causing it to be more likely to loosen or fracture. Instead of using existing teeth to support a bridge, a dental implant may be substituted to provide support for one or both sides of a dental bridge. This is a popular option that can provide a very secure restoration. This solution is particularly helpful when there are several adjacent missing teeth. This type of bridge is supported by a metal structure which is cemented onto the back of existing teeth. While not as strong as a traditional bridge, it can preserve the tooth structure of the adjacent teeth by avoiding the use of crowns for the abutments. It may not stay in place when heavy forces are placed on the restoration (such as biting and chewing) and does add pressure to the supporting teeth. Contact our office to learn more about your restorative options and achieve the smile you have always wanted.